If basement walls are simply damp, with no obvious leakage, a coat or two of QUIKRETE® Heavy Duty Masonry Coating (from powder mix) should solve the problem. If you see an obvious area of leakage, use QUIKRETE® Hydraulic Water-Stop Cement. First, determine if condensation rather than leakage might be your problem. Moist air due to high summer humidity or such factors as an imperfectly vented clothes dryer may condense on cold basement walls. To check for this, tape a 1 square foot piece of aluminum foil to the wall, making sure all four sides are air tight. Remove it after two days and examine it. If moisture is on the outside, your problem is condensation. Use a dehumidifier or ventilate to eliminate condensation. If the foil that is facing the wall contains moisture on the inside, then your problem is seepage and follow the steps using QUIKRETE® Hydraulic Water-Stop Cement first. See more information below. Mixing vessel, a concrete mixing box is ideal. For smaller jobs, a large pail or similar container will do. Clean the area using a heavy duty masonry paint brush or coarse-fiber calcimine brush. Ordinary brushes are not tough enough for larger areas. QUIKRETE® Heavy Duty Masonry Coating Coverage will range from 5 to 20 square feet per pound of mix, depending on surface. Previously painted surfaces and second coats require considerably less than new surfaces. NOTE: A dry powder cement paint when mixed with water fills and smooths the surface, becoming part of the wall. As a result, it is superior to other types of cement paint that are premixed liquids. Remove any paint, loose mortar, dirt, etc., with a scraper or wire brush. If old paint has Portland cement base, remove only the loose areas. For best results 75% of the original surface should be exposed to assure bonding. Scrub with wire brush and water to remove any loose material. If the wall does not come completely clean, mix some tri-sodium phosphate with water. Surfaces such as poured concrete, may require etching with a 20-25% solution of muriatic acid, followed by flushing with clean water. Pour paint into water and mix according to instructions on package. Dampen surface just before applying paint. Apply with a circular scrubbing motion to ensure penetration of waterproofing ingredients. First coat should dry 24 to 48 hours before applying second coat. QUIKRETE® Heavy Duty Masonry Coating continues to cure and harden for one month. Spray applications are also possible with most types of spray equipment. 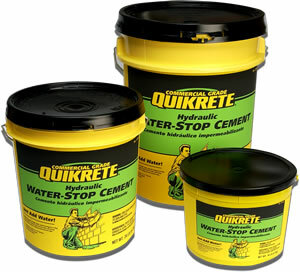 Do not use QUIKRETE® Waterproofing Masonry Coating on floors. 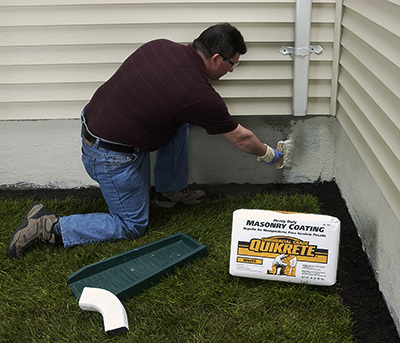 * IF WALLS ARE ACTUALLY LEAKING, QUIKRETE® Hydraulic Cement should be used first to plug holes and fill cracks. It stops running water instantly and sets in 3 to 5 minutes. Enlarge cracks and holes, removing all loose material. Cut squarely or undercut to a minimum depth and width of 3/4 inches. Do not create V-shaped cuts. Cut out the joints between walls and floor (3/4 inch minimum) and apply QUIKRETE® Hydraulic Cement, forming a U-shaped joint. Mix only enough QUIKRETE® Hydraulic Cement for a 3-minute application. With a wooden paddle mix 3 parts Hydraulic Cement to 1 part clean water. Roll mixture between hands until it is warm and starts to stiffen. Starting at the top of crack or hole, force cement into place, using maximum pressure. Maintain pressure for a few minutes until cement sets and leaking is stopped. Smooth surfaces with clean water, using fingers, board or trowel. Keep surface moist for 15 minutes. After thorough setting, entire area should be painted with Heavy Duty Masonry Coating to ensure proper seal. Repairing leaks in swimming pools, cisterns or any concrete or masonry wall, caulking and pointing chimneys, walls, sills, anchoring bolts and fixtures in concrete and masonry, forming an impervious seal around pipes and other metal fixtures.